Air flows through a spring-loaded, three-way valve to an up-cylinder of 2" diameter and a down-cylinder of 2.5" diameter. As the force to raise the hammer is small, a smaller up-cylinder is used for air savings. The larger down-cylinder has 500 lbs. of pressure when operated at 100PSI-inlet pressure. At rest the ram is up with 10.5" of open space; when the foot pedal is depressed, the ram lowers. A slow action on the pedal gives a light blow; a fast motion gives a hard blow. Tapping your toe gives a cycling repeating action for drawing or texturing. The machine does not go into a run mode by itself. The elimination of the automatic run cycle is what makes the air consumption so low. A small single stage 5 HP compressor will run the machine at 50% duty cycle. A two stage 5HP machine will provide all the necessary air needed for production work. Many times a single blow is all that is needed for a job. This is hard to get with run type hammers and is where the KA75 excels. 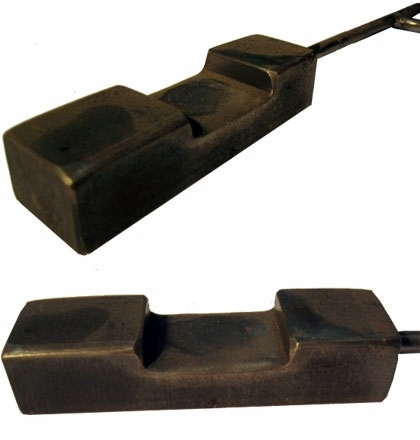 For punching holes, cutting, bending and swaging it duplicates a striker with a sledgehammer. 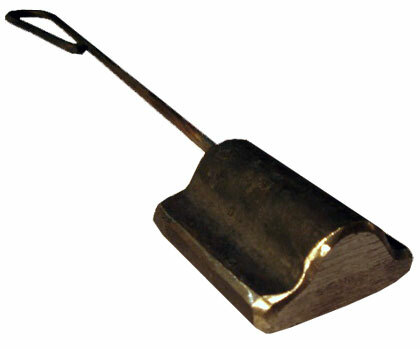 Grant Sarver of Tacoma WA invented the KA75 Striking hammer in 1995. Production was moved to Wisconsin in 1998 to be more centrally located in the U.S. for low cost shipping. An invention that began as a sketch on a napkin has continued to be bought by hobby and professional smiths & blacksmiths in the US and Europe. The KA is a tireless helper. The rugged construction and low-tech simplicity of the machine have created a loyal following of owners. The unconventional design of the KA75 has surprised many first time observers. It is compact and has only one foot-lever to operate it. There is nothing to adjust, yet the machine can hit a soft or hard blow, hit once or repetitively. The air cylinders serve as structure and motion in the design. The rods point downward which keeps dirt and scale away from the seals. Most parts are off-the-shelf components for easy replacement. We are open Mon.- Fri., 7:30 AM - 5 PM Central time. We do check our messages frequently and will respond as soon as possible.